Lake Superior is bordered by the US states of Minnesota, Wisconsin, and Michigan as well as the Canadian province of Ontario. The lakeshore of Lake Superior in Michigan. Lake Superior is the northernmost and the largest of all the Great Lakes. 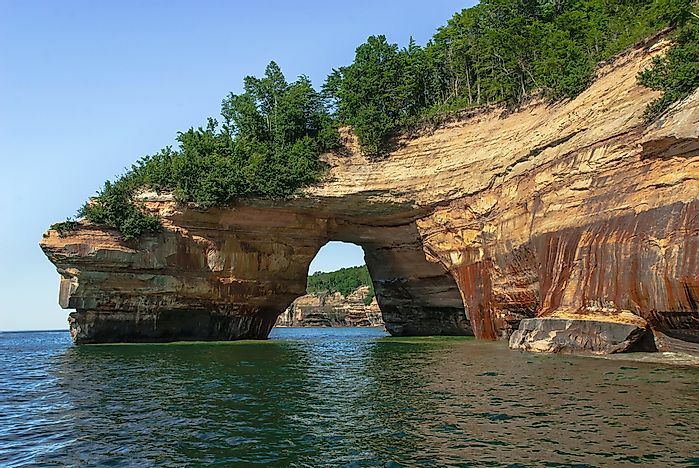 It is by far the largest freshwater body by surface area and the third largest by volume if lake Michigan and Huron are taken separately. Lake Superior is located at a higher altitude than the other four lakes. It drains into Lake Huron through the Soo Locks and the St. Mary's River. The lake lies south of Ontario, North of Wisconsin, northeast of Minnesota, and occupies the Upper Peninsula of the State of Michigan. The lake covers an area of approximately 31,700 square miles which is nearly the size of Austria or the State of South Carolina. Superior has a maximum length of 350 miles and a maximum width of 160 miles. The average depth is 483 feet, but in some cases, the depth increases to 1,333 feet. It holds 2,900 cubic miles of water and is the third largest overshadowed by Lake Baikal (5,670 cubic miles) and Lake Tanganyika (4,500 cubic miles). Superior has a shoreline of 2,726 miles. It is estimated that the volume of water in the lake is enough to cover the entire Americas to a debt of 12 inches. On July 30, 1985, Jeffrey Val Klump became the first person to reach the deepest point of the lake and the third deepest in North America after Great Slave Lake Slave (1,503 feet) and IIiamna Lake (942 feet). Lake Superior receives water from over 200 sources the largest of which include the Nipigon, St. Louis, Pigeon, and White Rivers. St. Mary’s river is the lake’s primary outflow and drains into Lake Huron. The rapids on the St. Mary’s river necessitated the construction of the Soo Locks to allow the movement of ships across the two lakes and to overcome the altitude difference between them. The lake is an important shipping location in the Great Lakes Waterway as it is a route that allows the movement of cargo from inland U.S and Canada to the Atlantic Coast. Millions of tons of iron ore, grains, and manufactured goods are transported across the channel in the lake and ocean-going freighters. During the winter the lake experiences heavy snow that covers the lake, forcing termination of transport services. What Are the Differences Between Inferior and Superior Planets? What States Border Lake Michigan?